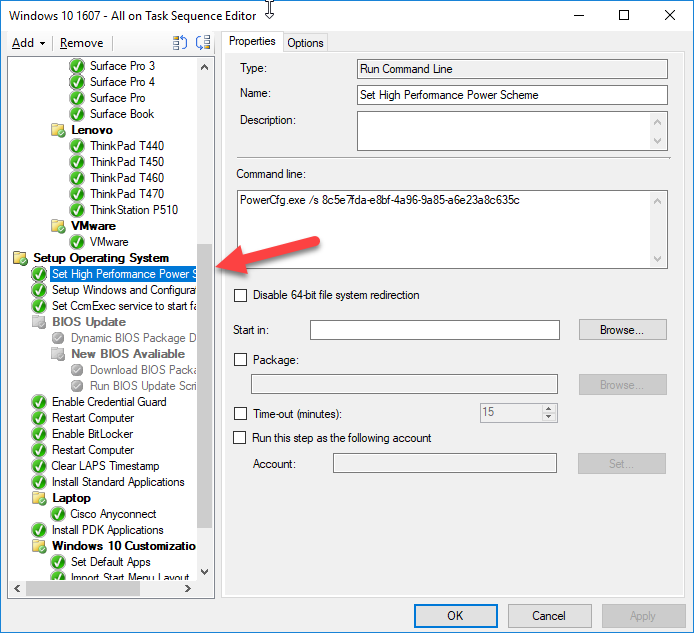 For the measurements in this post I’m on SCCM 1702 and using a ThinkPad T470s as the client. In order to measure the individual steps in the task sequence I’m using a report made by Thomas Larsen. The task sequence I’m using does a bare metal install with a Windows 10 1607 Reference Image totaling 9,8 GB. 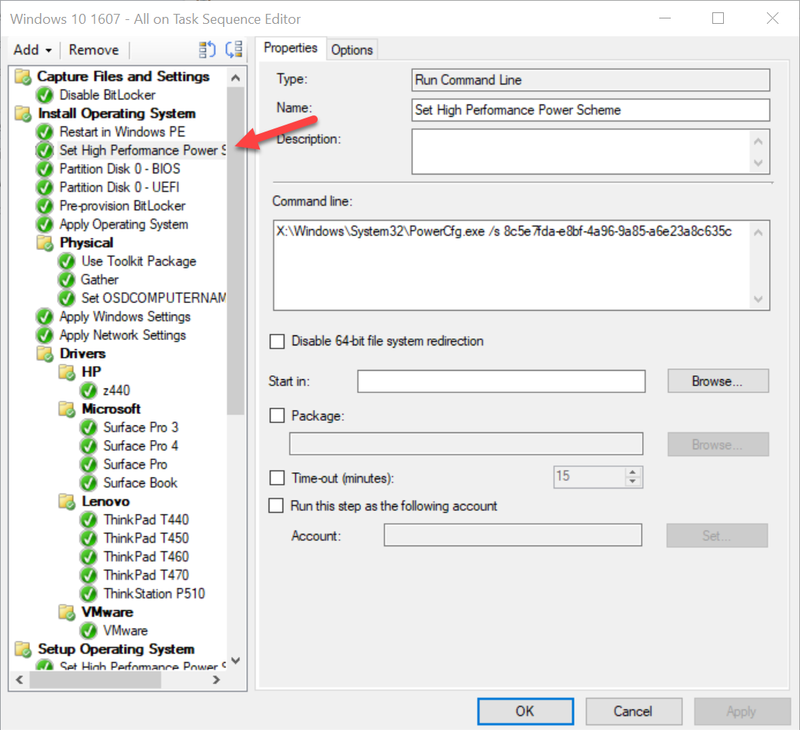 The first thing to speed up is changing the powers scheme, by default both the Windows PE and Full OS portion are run in balanced power scheme, so I wanna change it to High Performance. In my sample task sequence, running with the balanced power scheme the average execution time was 30:44. When changed the power scheme to high performance it dropped to an average of 22:58 minutes, an improvement just short of 8 minutes. By default the “Apply Operating System” step has two phases. first it downloads the wim-file to disk and then afterwards start unpacking it. On my test system this process takes around 9 minutes. This can be changed unpack the wim-file directly from the distribution point. In order to do this first a share has to be made for the wim-file and then the task sequence should be told to apply the wim-file directly from this share. In my testing this cut the time spent in half from 9 minutes down to 4 minutes and 40 seconds. Thanks! Need to test this. 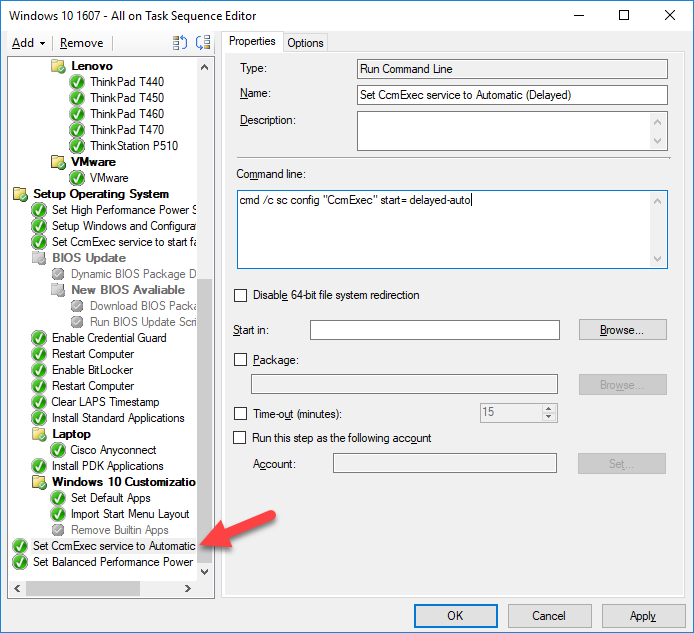 Have you tested how much power scheme adjust speeds up OSD? Yes, I’ve update the power scheme section with my timing result. I got a improvement of almost 8 minutes. Thanks Henrik. I will test this out and get my stopwatch out :). Take a look at the report I linked to at the top of the post, you can import it to your report server. It will show you the total time taken by a task sequence as well as time spent on the individual steps. Thanks – that will make it a lot easier. When I put the ccmexec service modification step in, I got an error 0x00000424 – service does not exist. I had to drop the quotes around the service name. Yep I had exactly the same. Thanks, regarding the ccmexec startup mode, it seems the task sequence reboots immediately after the “Setup Windows and Configuration Manager” step (and before the service =auto command), therefore at least one reboot still occurs with a delayed start. Is there a way to prevent that step from rebooting so we can change the start mode and then reboot? 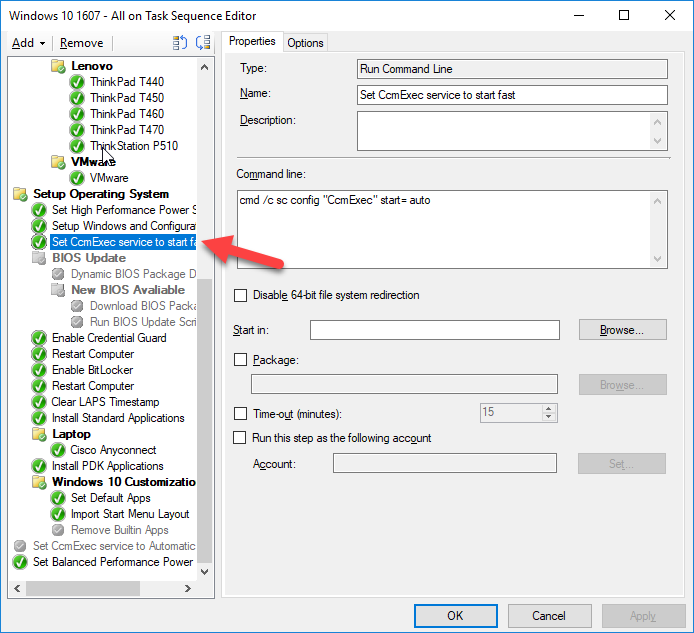 2) Setting the ConfigMgr client service from Delayed to Auto can cause tons of problems during the Task Sequence. Basically on faster PCs the client will start so fast that sometimes network connectivity is not fully available. End result is that the ConfigMgr client will evaluate to Internet instead of Intranet. This will result in the client looking for Internet based MPs and DPs. When none are available or cannot be reached because the client is actually Intranet, task sequence steps will start failing, especially the Install Application and Install Software Updates tasks. Thanks for the feedback, does any technet sites listed the recommended scenarios for #1 and the behavior in #2? I am actually probably going to write a blog article regarding this issue due to the problems it caused and due to numerous blogs all of sudden suggesting to change this setting. It may save some time for some customers, but for other customers it is going to result in a huge time and money waster when their deployments start failing. End result is they will have to remediate those PCs and spend precious time trying to figure out why they are failing. 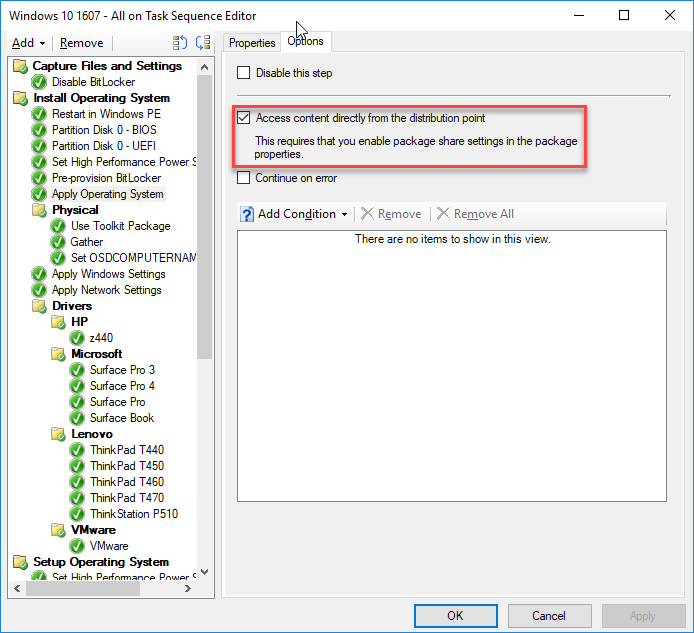 Configure the task sequence to access the operating system image directly from the distribution point. For example, use this option when you deploy operating systems to embedded devices that have limited storage capacity. 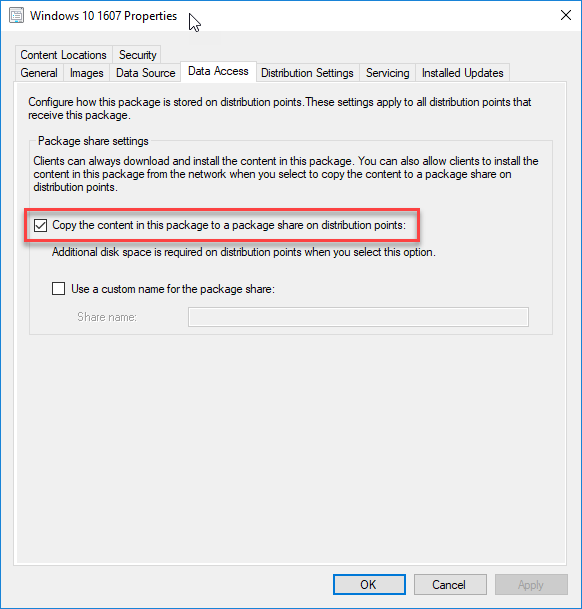 When selecting this option, also configure the package share settings on the Data Access tab of the package properties.